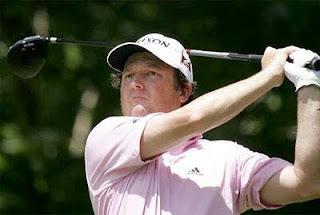 I think that most of us can sympathise with an incident that happened to South African player, Tim Clark on Saturday at the WGC-Bridgetone Invitational at Firestone Country Club, Akron, Ohio, on Sunday. It has probably happened to most of us on more than one occasion. Clark was paired with Padraig Harrington and had been tied for the lead, or trailing by one or two strokes, throughout the day. Tension was high when they approached the putting green of the signature 16th hole, a par-5 of 667 yards, with a pond in front. Tim Clark moved his ball marker to the side because it was on Padraig’s line. Unfortunately, he forgot to replace it when it was his turn to putt. Clark called the penalty on himself when he remembered at the 18th hole that he had forgotten to replace his ball at the 16th. He mentioned it to a PGA Tour rules official, who took him to the CBS TV trailer to review the videotape of the hole. Clark’s round of 71 became a 73, and he fell seven strokes behind, dropping from a share of 3rd place to 14th. This is a common mistake by golfers of all abilities. I am a poor golfer but I hate to lose strokes by breaching any Rule. So, what I do when faced with this situation, and I recommend that you do something similar, is to turn my putter upside down, gripping it by the head, as soon as I have moved my ball to the side. I hold it in this position until it is my turn to putt, when the way I am holding my putter triggers me to remember to replace my ball in its original position. Incidentally, it does not matter how you mark your ball to the side providing you exactly reverse the procedure when you are replacing it. There are 98 more tips like this on my CD, ’99 Golden Nuggets to Demystifying the Rules of Golf’, which retails at €19.99. For this month only, I will send you a copy for €15 (or $19), including postage.